We have a new Merry Monday Christmas card challenge, I am the hostess this week and my challenge is to Create a rustic Christmas card. My husband always like the rustic style Christmas cards, mostly because I usually incorporate some sort of buck or moose and probably some plaid as I did here. The gold highlights on the kraft cardstock is not exactly "rustic" but it falls along the lines of what you are seeing in the stores these days for design elements. Supplies: Kraft cardstock, Designer Paper - American Crafts, Paper Smooches- Tag die, Papertry Ink-Holiday Wishes, misc buck die, twine. Sweet tag with the stag head, Nina! So great on the buffalo plaid! Thanks for the fun challenge - so sad it's the last one at MM! Happy to have been on the time for this brief time and to have gotten to know all of you! Happy crafting!! Just wonderful - perfect for the inspiration. 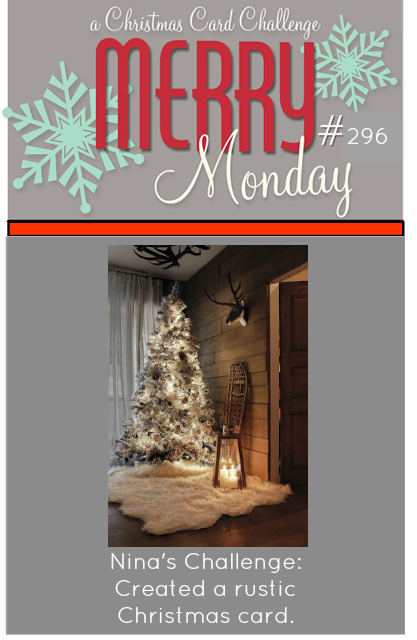 what a "creative" take on the inspiration photo...appreciate your part on the Merry Monday team, I've enjoyed looking! Love your rustic card Nina. Thanks for the fun challenge. I am sad to see MM go, but I have enjoyed getting to know you and the DT through our weekly challenges. What a great masculine card Nina and thanks for being a teammate on Merry Monday! A perfect farewell challenge! Darling card! I'm so happy to have been teamies together! Good challenge for the last one Nina, your card is awesome. Thanks for being on this long journey with me as a team mate, so sorry to see this is the last challenge. Best Wishes for the future. 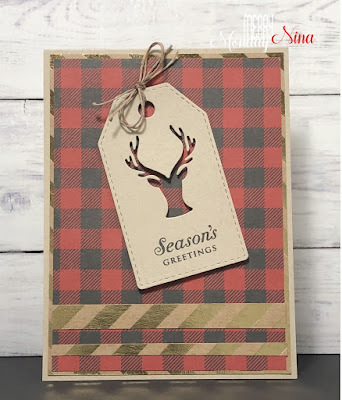 Awesome plaid paper and rustic card, Nina. Thanks for the challenge. It's been great being on the MM design team with you.